A rock song sung, composed and written by Naezy on the situation of our country. The video of this song is available on YouTube at the channel Naezy TV. This video is of 2 minutes 48 seconds duration. 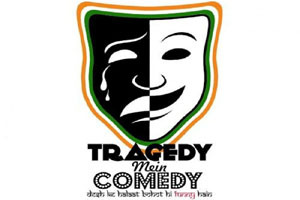 Lyrics of "Tragedy Mein Comedy"
Lyrics in Hindi (Unicode) of "ट्रेजेडी में कॉमेडी"